This English course book is for students studying for GCSE English and English Literature with the examination board AQA, specification A. The Introduction explains that it helps to ‘build the essential skills and knowledge to reach your potential in the GCSE English and English Literature exams’. There is a key for the various icons used in the book that signify spoken, reading, writing, and language activities. Students are shown that they will be able to check how good their skills are, develop and practise them, and improve them through the various activities. The speaking and listening, reading, and writing components of the course are shown in a table. There is in addition a table for the student to fill in every half term to show how confident they feel in each of the various skills. The final table in the introduction lists the skills that students will develop and practise and indicates how each skill will be assessed, whether through coursework or the final exam. Like every unit, this one opens with a table that shows which skills are to be developed. This first unit covers non-fiction texts such as diaries, journals, and autobiographies. Short spoken and written activities are followed by longer ones similar to those that feature in the final examination. To give an example of the type of activity, one of them involves giving a talk about a book, a song and an object the student would choose to take to a desert island. The second unit also centres on non-fiction, but this time in the form of newspaper and magazine articles, leaflets, and websites. The eight activities presented here focus on audience, analysing newspaper articles, and writing a two-hundred-word newspaper article about a hot air balloon making an emergency landing on the roof of a school. A sample answer is given for this article, with detailed comments by an examiner. Units 3, 4 and 5 deal with Post-1914 prose: ‘Lord of the Flies’, ‘Of Mice and Men’ and ‘The Catcher in the Rye’. Students would only be studying one of these three novels as a set text for the Literature examination; they may not in fact study any of them, as there is also the alternative of studying the collection of short stories in the AQA Anthology. Each of Units 3, 4 and 5 begins with a table indicating what skills will be developed, and this is followed by a second table listing the four assessment objectives and explaining what each one requires students to do. A third table gives information on the types of text that have to be studied for English Literature. Unit 4 on ‘Of Mice and Men’, as an example, then focuses on the novel in question through a series of activities grouped under sub-headings such as context, plot, setting, characters, and themes and symbols. A list of sample exam questions is followed by guidance on how to answer one of them. The unit concludes with two sample answers to different questions with comments on each paragraph by an examiner and a brief summary explaining why the first answer might merit a grade C and the second one a B. Units 3 and 5 follow a similar format for ‘Lord of the Flies’ and ‘The Catcher in the Rye’ respectively. A list of exam questions is followed by seven activities, concluding with a sample answer to the question ‘Write a persuasive article for a teenage fashion magazine about whether following fashion is important’. Examiner’s comments on each paragraph are followed by a brief summary stating that this would probably be produced by an A grade candidate. As well as guidance for these types of writing, the unit includes texts of speeches, leaflets, and persuasive letters with tips on their analysis. Once again a list of exam questions is presented. Following this, there are eight activities and finally a sample answer on ‘Writing a humorous description’. Once again, each paragraph of this answer is commented on by an examiner, and the summary suggests that the answer was written by a B+ grade candidate. The activities earlier in the unit focus on a Charles Dickens fact-file, a recipe for chocolate brownies, and an extract from the novel ‘Chocolat’ amongst others. This section is eight-and-a-half pages long and gives seventeen quick activities aimed at helping students to prepare for papers 1 and 2 of the English examination. They are intended to take ten minutes each at most and involve ‘thinking, planning and reflecting’. The first activity would help visual learners, as it requires the designing of a poster that gives information about what students need to know and do for each section of each paper in the examinations. Other activities present short text extracts followed by brief questions as to the text’s purpose or what kind of person wrote it. Activities for the writing questions involve, for example, writing a leaflet or the initial paragraph of a full answer. This is a seventeen-page chapter that begins with ‘Ten hints for successful revision’. These range from planning to ignoring students who boast that they are not bothering to revise. The chapter goes on to give advice on tackling both reading and writing questions and sets out a step-by-step guide to improving your grade. The final few pages present extracts from answers to the different types of Language and Literature questions, and these are followed by examiners’ comments or bullet points to trigger responses as to the strengths and weaknesses of the extracts. The glossary covers seven pages and includes basic terms such as verb, noun and adjective as well as more unusual terms like pathetic fallacy and enjambment. Some definitions are just one concise sentence, such as ‘Language that provokes a strong emotional response’ for emotive language. Other definitions are more detailed and give useful examples. This glossary is contained in one single page and defines the terms imagine, inform, describe, persuade and explain in some detail. The introductory paragraph emphasises the importance of following the instructions in a question. This book is intended as a textbook to be used in the classroom; it could also be useful for private tuition, for anyone being home-schooled, or for use at home by anyone looking for resources to support school work. It is important to remember, however, that this book is designed especially for the AQA A specification only. It is possible that students will be studying the short stories in the AQA Anthology rather than one of the novels featured in Units 3, 4 and 5; no activities centring on the short stories are featured here. The poems of the AQA Anthology are also not covered in this students’ book. The book’s use of illustrations and colour for text extracts and tables makes it appealing, and the short activities will draw students in quite easily. I do feel that it is lacking in the extended reading and writing activities that are required in examinations and perhaps is more suited to Year 10 students who have just begun the GCSE syllabus. Units 3, 4 and 5 on the Post-1914 Prose texts have very valuable activities, but there are of course other books such as the York Notes series that focus on individual novels. I did find it useful having lists of exam questions in Units 6 and 7 for the writing components, but I later found that past examination papers were available to print off on AQA’s website, so examples of writing questions can be obtained free of charge in that way. The past papers, however, do not feature the non-fiction and media texts of Paper 1, Section A for copyright reasons. This makes Units 1 and 2 of the students’ book a valuable source of developing the necessary skills, although I do still feel that a lot of the texts presented are on the short side. 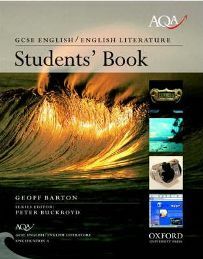 It is a useful, well thought-out and organised book, a good resource for private tutors as well as for classroom use. If you are buying it for private use, be sure that the examination specification is the correct one for your son or daughter, and be aware that the poetry and possibly also the short stories in the AQA Anthology form a very important part of the syllabus. Other resources may also be necessary to give more practice on comparing non-fiction and media texts. An accompanying teachers’ book is also available (ISBN 0198318944) that gives model answers to the activities in the students’ book as well as photocopy masters ‘to support the less able and to stretch higher-ability students’. 3 Comments on "AQA GCSE English/English Literature Students’ Book – Specification A"
I am looking to sell my own copy of this book and would like to know if this book is still being used for the current AQA GCSE English/English Lit syllabus. Yes, I believe it is. I have a degree in Fine Art but never actually worked in that field. After almost two years in Paris, I moved to Cairo and spent many years there teaching English language and literature in schools. I came back to the UK in 1999 and now work with young children. I also tutor students of all ages in French, English or Maths. I enjoy writing reviews in my spare time; another hobby of mine is photography. I have two sons who are now grown up, both working in IT.